How are you and your wife after the Japan tour? Did you modify the images of this country before coming to Japan? While you and your wife came to Japan. Some mass media featured the historical topics of the anniversary 70-year after the war. One of them televised the documentary story interested me most. So I have to let you know and show my appreciation of Sri Lanka. Do you happen to know the first President of Sri Lanka, Junius Richard Jayawardana who saved our country where would be divided into several occupied sections? 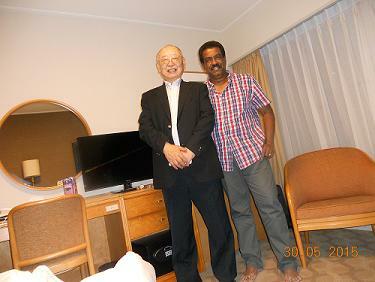 Without him you would find and travel another Japan. Date back to 1951, Treaty of Peace with Japan after the WW2 end 1945(I have a little memory even at my age 4), J.R. Jayawardana made a brave speech at United Nations to beg off huge reparations instead many countries had intended to impose on in addressing “Hatred ceases not by hatred but by love.” Our late Prime Minister Yoshida told many times that we owed to him due to the sudden change of hostile atmosphere in meeting. Finally the divided sections to occupy plan was deleted. 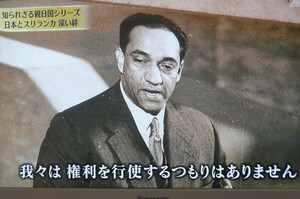 “We Japanese people never forget him Jayawardana forever.” The reparations were completed in 1976 to pay many Asian countries except for Sri Lanka. Thank you for reading by the end. Copyright © 徒然の記 All Rights Reserved.